Those are some of the lyrics from the theme song to the popular 1970s TV sitcom 'All in the Family', considered controversial in its day, about a working-class bigot named Archie Bunker, who sang it at the top of the show with his wife Edith. Archie's nostalgia for pre-1960s America informed much of the show, which satirized small-minded conservativism, paranoid patriotism, contempt for youth culture, and racism. 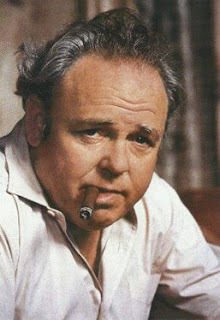 One of the ironies of Archie Bunker's worldview is that the 1930s, 40s, and 50s weren't nearly as conservative as he remembered them. The same faulty nostalgia drives the so-called conservatives of today's Republican Party and the Tea Party movement, who imagine those decades as a time when hard-working Americans pulled themselves up by their own bootstraps. It's true that Americans worked hard during these years. But the bootstraps stuff is nonsense. The 30s through early 60s were the time of the New Deal, low-cost loans from the Federal Housing Administration, the GI Bill, huge subsidies for defense contractors during the Cold War and other industries that employed millions of people, massive transfer of funding from cities to the burgeoning suburbs, federal projects like interstate highway construction and the space program, generous investment in public schools, record union membership, high tax rates for corporations and the wealthy, good job benefits, and Social Security, Medicare, and Medicaid, which ensured financial stability in old age and medical crises. These things softened the trauma of the Great Depression and gave us the greatest period of prosperity in US history. Middle-aged Tea Partiers and Republicans, born in the 1940s through the 1970s, reaped the benefits of the kind of progressive 'big government' and 'socialist' ideas they now condemn. By their own standards, Tea Partiers are practically red diaper babies. The irony of the Cold War's capitalism vs. communism paradigm is that capitalism in the US and other western countries required generous helpings of socialism to make it function adequately. Conservative politicians like Eisenhower and Nixon seemed to understand this and generally supported the social programs listed above. Since the Reagan Administration, Republicans, with help from Democrats, have worked to dismantle such programs and policies. Since 2008, the conservative movement has been galvanized by President Barack Obama's victory (although Mr. Obama's actions in office hardly place him on the left), leading to the formation of the Tea Party and igniting the conflict in Wisconsin over Gov. Scott Walker's plan to cut benefits for public-sector employees and abolish collective bargaining rights. The economic principles of today's GOP and the Tea Party don't come from any period of time within their own memory, so it's difficult to identify what kind of values they're trying to preserve or restore. But if we look further back in American history, to the late 19th century, we can find a match in the Robber Baron Era. The Robber Baron Era was a period of misery for the millions of Americans who worked in factories before child labor laws, the eight-hour day and 40-hour work week, workplace safety laws (think of the 1911 Triangle Shirtwaist Factory fire), or recognition of collective bargaining rights. It was a time of widespread political corruption, with officeholders in cahoots with the chiefs of monopolies and near-monopolies. Laissez-faire capitalism was mostly unchecked by the power of unions or by government regulation. It ended with a period of widespread labor unrest and the reforms of the Progressive Era (1890s through the 1920s). "Republicans in Wisconsin are seeking to reverse civic traditions that for more than a century have been among the most celebrated achievements not just of their state, but of their own party as well.... [W]hile Americans are aware of this progressive tradition, they probably don't know that many of the innovations on behalf of working people were at least as much the work of Republicans as of Democrats.... The demonizing of government at all levels that has become such a reflexive impulse for conservatives in the early 21st century would have mystified most elected officials in Wisconsin just a few decades ago. When Gov. Gaylord A. Nelson, a Democrat, sought to extend collective bargaining rights to municipal workers in 1959, he did so in partnership with a Legislature in which one house was controlled by the Republicans. Both sides believed the normalization of labor-management relations would increase efficiency and avoid crippling strikes like those of the Milwaukee garbage collectors during the 1950s. On the evidence of history, calling today's Republican Party and their Tea Party supporters 'conservative' is as absurd as calling supporters of civil rights and racial justice 'reactionary' because they invoke the values of the Reconstruction Era. Gov. Scott Walker is not a conservative, nor is Gov. John Kasich of Ohio. Neither are Fox News, Newt Gingrich, Sarah Palin, Rush Limbaugh, or any of their fellow corporate royalists and faux populists. They are radicals. The GOP and the Tea Party are inspired by a vision that's partly reactionary (revival of Robber Baron Era economics) and partly innovative, with world-changing ideas that would have astounded JP Morgan and John D Rockefeller. It's worth noting here that such agenda are bipartisan, supported by mainstream Democrats. One of the top claims of 'conservative' activists is their devotion to the US Constitution and the ideals of our Founding Fathers, which motivated the reading aloud of the Constitution in the US House of Representatives in January when Republicans took over as the majority. For Republicans and Tea Partiers, the Constitution might as well be written in hieroglyphs. Except for the Second Amendment's right to bear arms, they decline to apply the Constitution to the denial of habeas corpus, warrantless surveillance of US citizens, torture, disregard for international treaties signed by the US, and other abuses that are clearly outlawed. On the other hand, they enthusiastically defend the Supreme Court's 2010 Citizens United ruling, which upheld 'corporate personhood' and exacerbated the widespread corruption of our election system, even though the Constitution grants no rights to corporations and the Founding Fathers warned against the excessive power of the monied interests. Corporate personhood was enshrined by a series of Supreme Court rulings, beginning with Santa Clara County v. Southern Pacific Railroad in 1886, which extended the 14th Amendment's equal protect clause to cover corporations. The rulings coincided with the post-Reconstruction passage of the first Jim Crow laws in the South and the beginning of the Robber Baron Era. In effect, legal rights and protections were transferred from black people to corporations. All of this gives us a clue about the real ideology motivating today's conservative (and many liberal) politicians, media pundits, and activists: corporate power, profit, and privilege. All other principles are subservient to corporatism. The GOP isn't opposed to socialism when it satisfies corporate lobbies, as the Wall Street bailouts prove. Consider Gov. Rick Scott of Florida, currently on a mission to overturn the Democrats' health care reform bill. Does Gov. Scott really oppose public spending for health care? In 1997, he was forced to resign as CEO of Columbia/HCA after the company pleaded guilty to 14 felonies and agreed to a $600-plus million fine in the largest fraud settlement in US history, for fraud involving Medicare and other public health programs. For bilking taxpayers out of hundreds of millions, Rick Scott was paid $9.88 million and allowed to keep 10 million shares of stock worth over $350 million. Republican politicians might be gunning for Medicare and Medicaid, but they're not above making a killing from such programs, on behalf of themselves and the corporations they're connected with via the public service/private business revolving door. The same ideology informs the granting of no-bid contracts, tax breaks and loopholes, and other forms of subsidies to favored firms. George Lakoff notes that "The wealthy have, to a large extent, amassed that wealth through indirect contributions to them by governments -- governments build roads corporations use, fund schools that train their workers, subsidize their energy costs, do research they capitalize on, subsidize their access to resources, promote trade for them, and on and on." Dedication to corporate interests overwhelms all other concerns. It turns the conflict between free-market capitalism and socialism into a quaint relic from another century, rather like the conflict between the German princes and the Roman Catholic Church during the Reformation. It makes the free market into a myth for the gullible who believe that locally owned Main Street shops can compete with WalMart or Old McDonald's family farm has a chance against Monsanto. Conservatism means, or should mean, emphasis on entrepreneurialism (as opposed to corporate capitalism), self-reliant local economies (small businesses and farms, rather than big chain stores and agriconglomerates), economic security for Americans (freedom from destitution because of unemployment, old age, or the cost of medical emergencies), democratic sovereignty (rather than subordination to international trade cabals), observance of the US Constitution and international laws and treaties that the US has signed (Article VI), and deployment of the US armed forces solely for immediate self-defense. Today's conservative leaders, except for a few mavericks like Ron Paul, have abandoned these ideas and replaced them with a scheme to manipulate government for a radical redistribution of wealth from the bottom to the top. For these politicians, government is only a threat to America when it benefits working people or the poor or public health or the environment. Big government for big business is perfectly acceptable. The amassing of wealth and power for the corporate sector has become the major project of the GOP in the 21st century, with the Democratic Party's cooperation. We need terminology that more accurately describes political tendencies in the US and world in the 21st century, placing the rule of corporate elites and militarism on one side and democracy, human rights and freedoms, and the health of the planet on the other. The traditional spectrum of Republican-conservative on the right and Democrat-liberal at the left, with a gray area for moderates in the middle, belongs in the trash. The 'centrist' gap between the two parties is really an overlap where Republican and Democrat politicians are most enthusiastically loyal to corporate lobbies, with euphemisms like "Republican moderate," "Democratic Leadership Council," "blue dog," and "triangulation" to describe them. A more accurate spectrum would find most Republicans at the furthest extreme and most of the Democratic Party next to them. This is the side that serves corporate power, profit, and privilege. It embraces the ideology that underpins state capitalism, a condition in which major corporations have grown so powerful that government's chief purpose is to take marching orders from them. What's on the other side of the new spectrum? In the US, not much, if we're talking about political clout. Some Democrats like Dennis Kucinich, Greens, environmental and community activists, socialists, unions that haven't placed allegiance to Democratic politicians ahead of their members' needs, even some libertarians and traditional conservatives who recognize that unrestrained corporate power is as much a menace as state power. Those who are nostalgic for the old spectrum will ask why the Democratic Party and leaders like President Obama should be placed so near to the GOP. The Obama Administration provides the answer: Obamacare, in which minimal health care reforms are offset by mandates to purchase private health insurance, a legally questionable idea that originated with Republicans in the 1990s. Greenhouse gas emissions trading ('cap and trade'), allowing corporate polluters to purchase and trade licenses to continue polluting. Modest financial industry reforms, such as the 2010 Dodd-Frank Act, that don't restore the Glass-Steagall Act (thanks to anti-regulation ideologues in the White House like Timothy Geithner and Larry Summers and Wall Street's buyout of Congress). Rhetorical support for public-sector workers in Wisconsin, but no repeal of the anti-union Taft-Hartley Act. Social Security, Medicare, and Medicaid facing graver danger from Democrats now than from the GOP. Record incarceration rates, with young black, brown, and poor white men filling up cells in an inmate-hungry for-profit prison system. What about Mr. Obama's recent defense of nuclear power and his air assault, with France and the UK, on Gadhafi's forces in Libya? He defends both on 'liberal' grounds: nuclear power as an alternative energy; assistance for rebels in Libya to promote democracy. Neither explanation holds water. Nuclear energy is not a safe, clean alternative, as the Japan catastrophe proved, and his refusal to assist democratic uprisings in other countries ruled by dictators (Saudi Arabia, Yemen, Bahrain) suggests that the President ordered the attack on Libya for other purposes, such as the demand of energy lobbies control over Libyan oil resources. Mr. Obama's huge subsidies for new nuclear power plants in Georgia will allow private companies to reap huge profits, while shifting the high costs and liabilities to US taxpayers. Progressivism has nearly collapsed as a political force, even though progressives still exist and sometimes get elected. We can begin digging ourselves out of this hole by adopting a new model to replace the Republic/conservative/right vs. Democrat/liberal/left paradigm. We can declare our independence from the bipartisan consensus and two-party electoral politics. We can reject the "active propaganda machinery controlled by the world's largest corporations [that] constantly reassures us that consumerism is the path to happiness, governmental restraint of market excess is the cause of our distress, and economic globalization is both a historical inevitability and a boon to the human species" (David C. Korten, 'When Corporations Rule the World'). Doing so will bust open the narrow political debate offered daily in the mainstream media. It will give us a revolutionary chance to reverse the dangerous direction of the US in the 21st century, which now promises decades of perpetual war (we're in two and a half already: Afghanistan, Iraq, and Libya, not to mention the so-called wars on terrorism and drugs), undiminished fossil fuel consumption as the climate heats up, privatization of dwindling resources like fresh water, an ever-widening gap between rich and poor, the collapse of financial security for working Americans, concentration of power and wealth among a small number of 'too big to fail' firms, and growing government and corporate intrusion into our private lives. Call it Corporate America vs. We the People. Globalization vs. Mother Earth. Privatization vs. the Public Good. Wall Street vs. Main Street. Plutocracy vs. Democracy. Which side are you on?